TRADER 9: Trade of the day, NYMX!!! 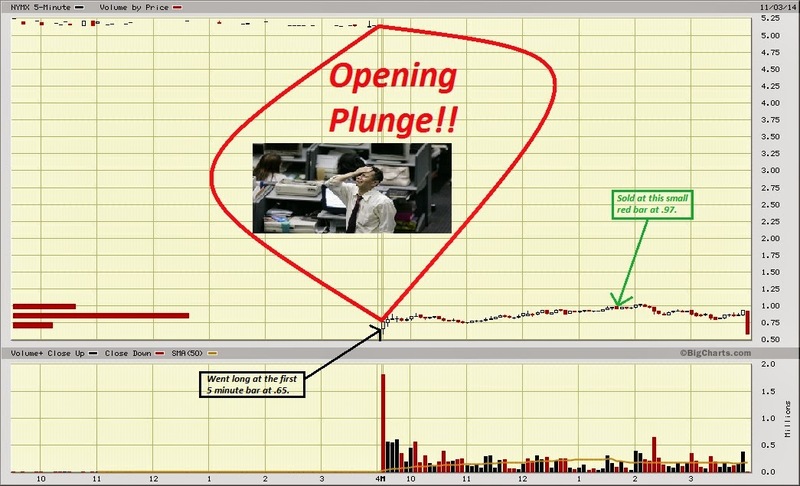 Caught the bounce on NYMX today when it opened down at a crazy level because their Phase 3 study failed. Went long 3000 shares at .65, pretty much right at the open. I placed my stop right at .64 and decided just to ride this stock out till the end of the day, or until it gets to one dollar a share. Most stocks that collapse to way under a dollar a share after trading above $5 or more the perivious trading day rarely get over back over a dollar when they bounce, so decided to sell at .97 for a nice $960 profit today.